Already seen the pyramids and want to delve deeper into Cairo? 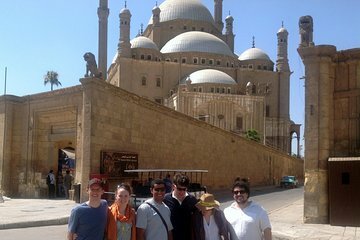 Discover some of the Egyptian capital’s other famous and lesser-known sights on a private tour with an Egyptologist guide. Your trip starts at the Egyptian Museum, the world’s largest repository of age-old Egyptian artifacts. See Tutankhamun’s treasures, including his death mask, and view other highlights such as ancient mummified animals. Visit the Citadel of Saladin to admire the Mohammed Ali Pasha mosque, and stroll around Coptic Cairo, seeing the 3rd-century Hanging Church and other fabled religious monuments and sites.